Now that it’s fall my oven is being abused heavily. One of my favourite things to do: roast squash. Roast squash is delicious on its own (I almost ate all of it while I was assembling this pudding — it was in danger of becoming squash-less) but even more delicious when you toss it into other dishes. Squash instantly gives things a holiday harvest feel. I especially love how tiny acorn squashes are compared to butternut or spaghetti. I have a major obsession with tiny food and acorn squash is probably the tiniest squash that is edible and delicious. Squash wasn’t something we ate growing up at home, unless you count zucchini. Day old bread wasn’t a thing either so we never ate bread pudding or stuffing. Actually, thinking about it, we never even had old bread at home. Our Thanksgiving dinners didn’t have stuffing or dressing in the turkey or out of it. Instead, my mom made sticky rice as a side. Because I had never actually tasted stuffing, it was kind of this mythical thing to me. I remember one Thanksgiving my brother came home proclaiming that he was going to make stuffing. I ended up loving it but my mom and dad were basically disgusted. They just didn’t get why stale bread soaked in stock and then baked was a delicious thing. Actually, I find that stuffing is a love it or hate it kind of dish, especially if you haven’t grown up with it. 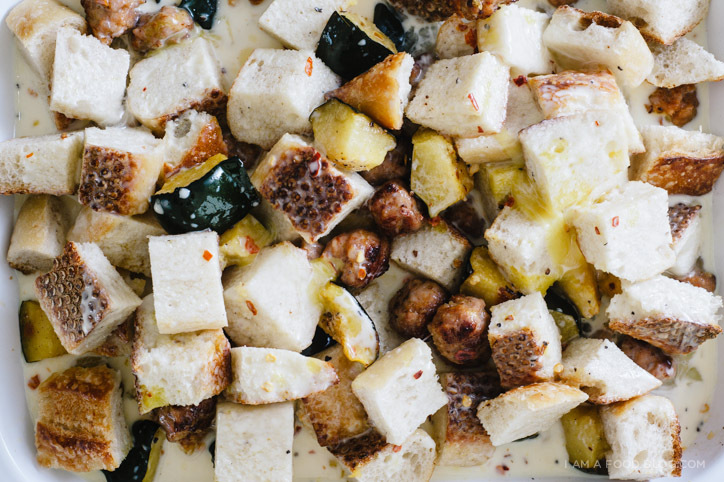 Personally, I love stuffing and of course, its sweet friend, bread pudding. As far as I can tell, the main difference between stuffing and bread pudding is the use of eggs. Oh, and the fact that most bread puddings are sweet. I love a sweet breakfast, but sometimes only sausage will do. 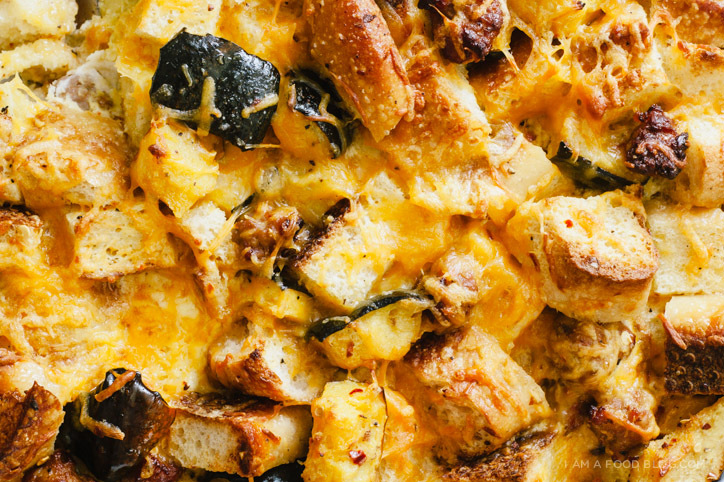 Add in some roasted acorn squash, giant bread cubes and cheddar and you have yourself a party! 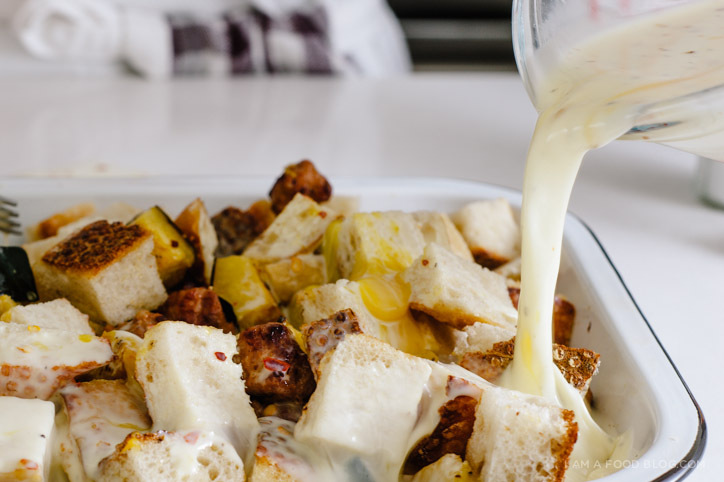 Crispy, crunchy, toasted bread tops with custardy soft insides, this breakfast pudding is something I could eat all day, every day. Cut the acorn squash in half and scoop out the seeds. 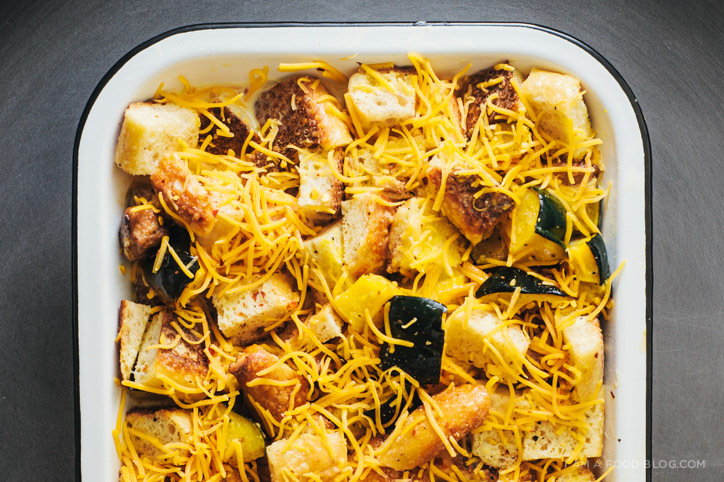 Cube the squash, toss with oil and roast on a tin-foil lined baking sheet until tender, about 40 minutes. Remove from the oven and set aside. Turn the oven temperature down to 350°F. While the squash is roasting, brown the sausage. You have two options here: you can ball the sausage up and then brown it or you can just break it up in the pan as you’re cooking. When brown and crispy, remove from the heat. In a bowl or liquid measuring cup, whisk together the eggs, milk and cream. Season the egg mix with salt, pepper and red pepper flakes, if using. 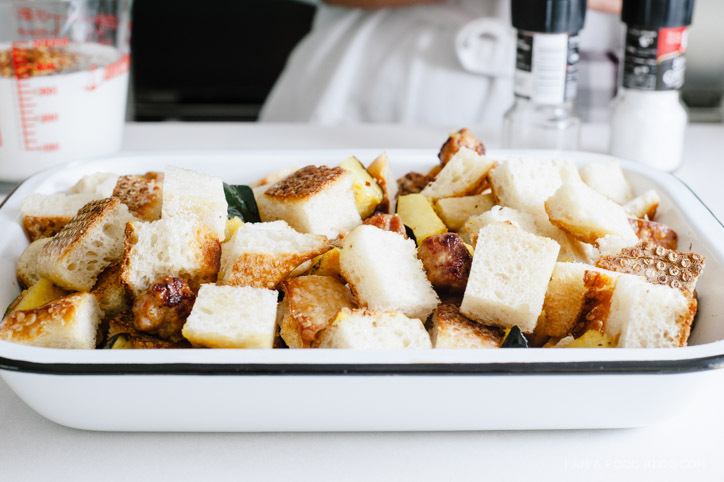 In a large oven proof casserole, toss the squash, sausage and bread cubes. Pour the egg mixture on and top with the shredded cheddar. Bake for 40 minutes, until the cheese has melted and the pudding is golden and puffy. Enjoy warm. This looks delicious! I love stuffing, it is what I look forward to every thanksgiving!! 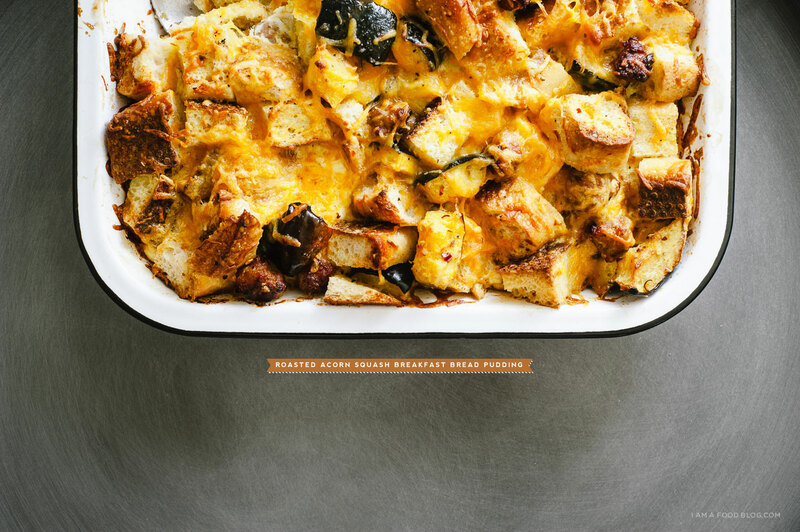 We make a breakfast casserole every Christmas that looks a lot like this one, but I’d never thought about adding roasted squash to it- thanks for a great idea! Squash is my favorite part of Thanksgiving, particularly because of my mom’s awesome recipe. I always think of it as being really different from bread pudding though. In my mind, bread pudding is more creamy and cake-y while stuffing is more crumbly, although it can be soft too. 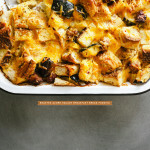 Savory bread pudding with squash? Now that is a great idea. This recipe looks fantastic! I love the name too – breakfast pudding. This is right up my alley. Oh man, this is one of your best/prettiest creations yet, Steph! (Though I am still obsessing over that mapo tofu waffle!) I need this on my breakfast table. Love the flavors and textures, sounds SO GOOD! I love stuffing too, it’s my fave part of Thanksgiving…. now I’m thinking about adding pumpkin to mine this year……..
hotdaaaang girl. You can take some good photos. always love your graphics too!